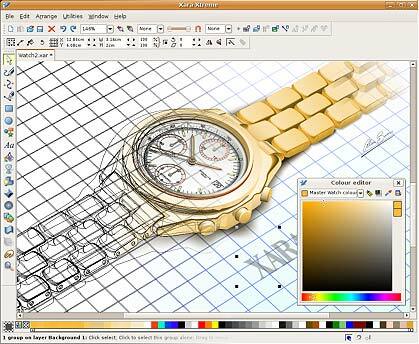 When you think of vector drawing in Linux, do you think only about InkScape? But there are several programs for drawing vector graphics with many features. In this series of articles, I will address several graphics programs available on Linux, starting with a not very known, Xara Extreme. Xara Xtreme for Linux is a powerful general-purpose graphics program for Unix platforms including Linux, FreeBSD and (in development) MAC / OS-X. Formerly known as Xara LX, it is based on Xara Xtreme for Windows, which is the fastest vector-graphics program available. The source code of Xara Xtreme was released in open source in early 2006 and is being ported to Linux. This process is almost complete and Xara Xtreme for Linux is available for download now. Xara Xtreme for Linux (or Linux Xara Xtreme Edition) is the open source version of Xara Xtreme. It was formerly called Xara Xtreme LX or just Xara LX, LX is an acronym for Linux. The name “LX” is maintained in some places (eg, the executable is still called “xaralx”). The first version was released for Linux in October 2005, and Xara Group Ltd. announced it will release the source code for the Linux version (a simplified version) under a free software license, the GPL, and seek help from the community in porting to Linux and Mac OS X using the wxWidgets toolkit. In the opening of the Libre Graphics Meeting 2006 in Lyon, France, Xara has released most of the source of Xara Xtreme for Linux on an updated website with information on how to access the source code of the software. According to the Xara Xtreme for Linux Homepage, the source code released contains “most of the sources of Xara Xtreme”. Currently, the only part of Xara Xtreme for Linux that is not under GPL is the rendering engine CDraw, which is only available as static libraries for some selected CPU architectures and only for C + + compiler GCC, but , there is not the intention of releasing the CDraw engine of Xara on GPL, since it would hurt the sales of their other paid products for the Windows platform. The 0.3 beta series for the first time, allowed the use of the new file format *. xar to the open source version. Previous versions only supported for opening and viewing packaged demo files which came along the product, to show its capabilites. Version 0.5 was the first to also have the ability to save. The current version is 0.7. A version for Mac OS X is still non working, but it is in development, and there is a call for developers on the project site. Opens and renders all the XAR files. Rendering 100% complete. Text now renders (note that text will only render exactly as intended by the designer if you have the required fonts installed on your system). Magnetic object snap. Grid snap and grid display. Import/export of many ImageMagick supported types inclduing TIFF, BMP, PICT, XPM and others. Full comprehensive Help now integrated. Previous PostPrevious Can you think of a better way to spread the use of Linux?